How does elevation affect temperature? Is there a simple way to estimate the summit temperature if I know the temperature at the base? Like a lot of things in meteorology, it’s fair to say you can “kind of” estimate the summit temperature by recording the temperature at the mountain’s base. But before we get into numbers, it’s important to remember that temperature can vary for a number of different reasons: shade, sun, nearby buildings (or lack of them) and inversions (colder air sinking into valleys because it’s heaver than warm air) can all influence the temperature. 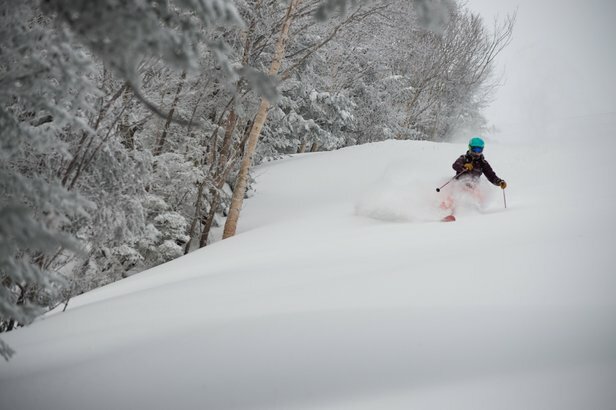 These caveats aside, here’s the scoop on temperature and elevation. If there's no snow (or rain) falling from the sky and you’re not in a cloud, then the temperature decreases by about 5.4°F for every 1,000 feet up you go in elevation. In mathematical speak that is 9.8°C per 1,000 meters. However, if you’re in a cloud, or it is snowing/raining, the temperature decreases by about 3.3°F for every 1,000 feet up you go in elevation. Thus meaning it’s a change of 6°C per 1,000 meters. And now for the nerdy science part. Atmospheric pressure is simply the weight of the air pushing down on you from above. As you increase in elevation, there is less air above you thus the pressure decreases. As the pressure decreases, air molecules spread out further (i.e. air expands) and the temperature decreases. 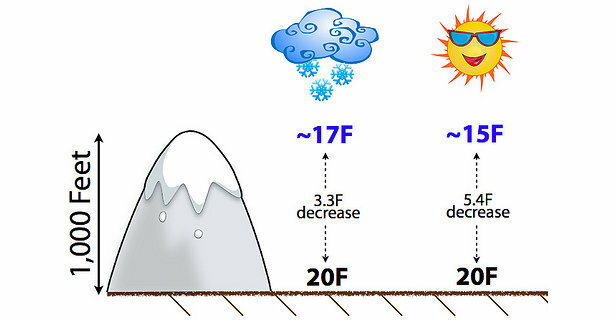 If the humidity is at 100 percent (because it’s snowing), the temperature decreases more slowly with height. So let’s put all this theory to the work. Say you wake up at your favorite Colorado resort and it’s snowing hard. If the temperature at the base is 20°F and the summit is about 3,000 feet higher, then you could estimate the temperature at the top would be about 10°F (3,000 feet elevation change at 3.3°F per 1,000 feet equals about 10°F temperature decrease). Or perhaps you’re at the top of the mountain on a sunny but very cold day with temperatures around 5°F at the top. It’s early afternoon and while it was cold when you started the day at the base, you’re now thinking it would be fun to head to the bottom to have a beverage and sit in the sun. But will it be warm enough down there? Of course! 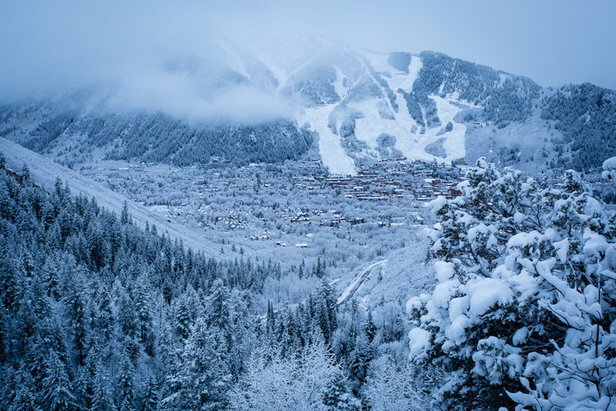 Since it’s about 5,000 feet between the summit and the base of the mountain, the temperature at the base village should be about 27°F warmer than at the top (5,000 feet elevation change at 5.4°F per 1,000 feet equals about 27°F temperature increase). So the temperature at the base should be around 32°F, and in the sun after a nice day on the hill, this is the scientifically perfect temperature to enjoy an outdoor beverage. Just remember that temperature changes 5.4°F/1,000 feet (9.8°C/1,000 meters) if it’s dry and 3.3°F/1,000 feet (6°C/1,000 meters) if it’s snowing. Click here for more articles on mountain meteorology.